What Ever Happened to Fortran? The first of my video series that show you how to fix stuff yourself. The IBM Selectric is my favorite typewriter, and most who own one have it jam up or fail every so often. But in most cases you don't have to call out a service technician to get it working again, you can maintain the typewriter yourself. In this video I show you how to take it apart, where the main problem areas are, and how to clean and where to lubricate the machine. No tools needed for this project! It is all really easy, and with some oil and patience you will be back to typing in no time at all. 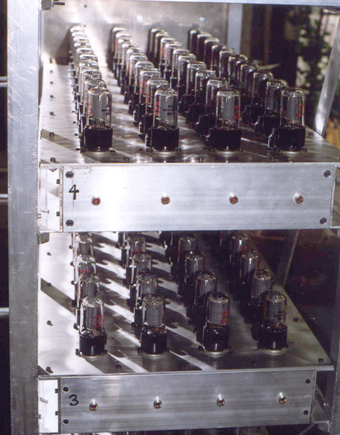 In the summer of 1999, while JC Morrison was beginning the initial design for the big vacuum tube tester I began work on the first of two automated vacuum tube burn-in machines that would be used to 'cook' sets of amplifier tubes for a measured number of hours. This would stabilize their transconductance so that they could be valued and matched with other tubes to create matched sets with the tester. These machines held 6 trays of 40 8-pin tubes for a total of 240 tubes each, and were made to repeatedly cycle rows of 10 tubes through power up and standby states over a 12-24 hour period. Like the later tester machine I made this by hand from raw stock. All of the trays had to mate up with all of the bays in all of the machines, so there were tremendous tolerance issues in constructing the whole system. The trays took a lot of time to manufacture, and the EH production staff was employed to help in wiring them. Without their help it probably would have taken me a full year to complete the wiring alone. Do not attempt at home - It is not a good idea to solder while wearing shorts. Just so you know. The heart of the machine was JC's brilliant all tube regulated high voltage supply, and the mind of the machine was my automation control unit pictured on the right. 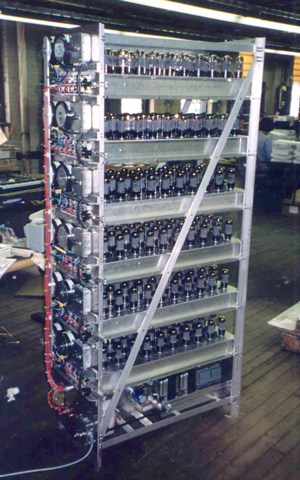 It controlled and monitored the distribution of the high voltage, had alarms for shorts, and set the fixed bias voltage for the tubes. 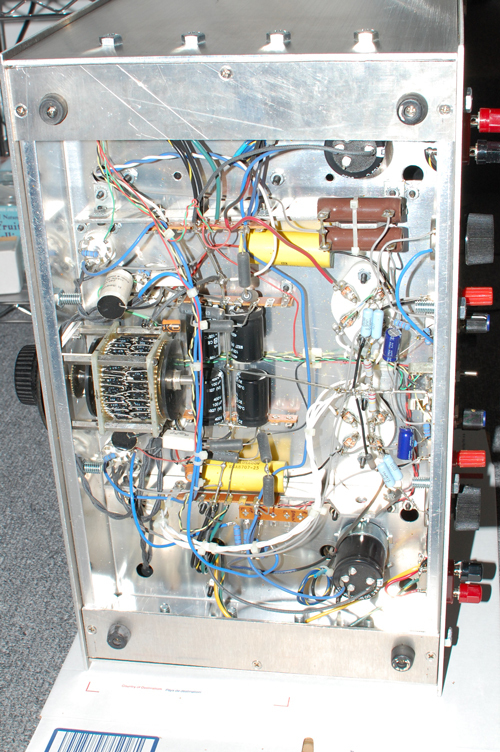 Even more fun was to come upon the completion of the first tube burning machine when JC and I began work on the vacuum tube tester late in the summer of 1999. 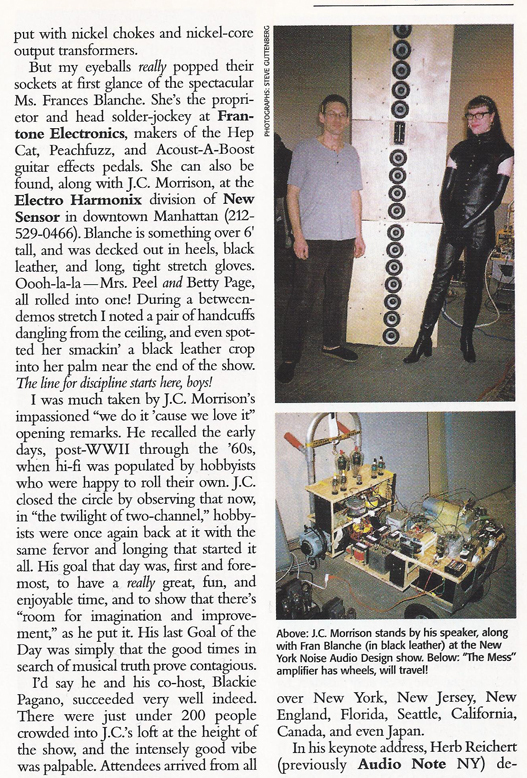 The Electro Harmonix / New Sensor Corp.
Before being given the task of designing the 2000 NYC Big Muff for Electro Harmonix, I worked on the tube tester project for about 6 months, beginning in mid to late 1999 to early 2000. It was built at the Electro Harmonix factory at Astor Place in Manhattan to test 40 vacuum tubes at a time for matching sets of tubes for amplifiers. 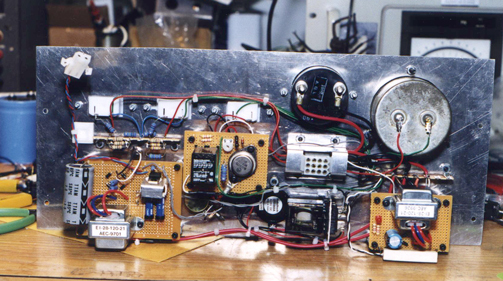 J.C. Morrison is a brilliant designer, and he built the manual testing panel and the all-tube regulated power supply. Mike Abram designed the computer software and PC interface. J.C. and I designed the integrated onboard systems. I designed the relay matrix, high voltage power supply, and power distribution systems. 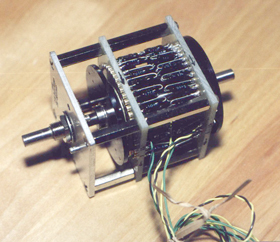 I also built the entire unit myself with the exception of J.C.'s components, and did all the wiring. So much wiring! The tools used consisted of a hand drill, small drill press, a Bosch scroll saw, a 10" chop saw, and various hand tools. This is truly a hand made machine, with nearly every part of it built from raw stock. 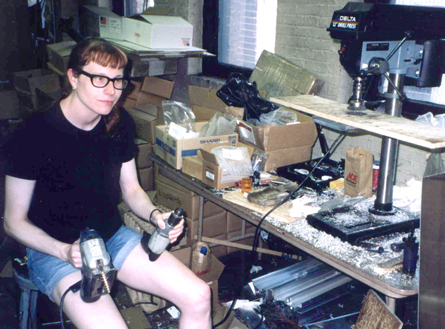 at the EH Factory in Manhattan, January 2000.
for applying the necessary force to mate the 144 Jones Plug pins in the dock. This is a detail of the inside of the relay matrix. It was quite a design and construction challenge in itself. This is the underside of a tube tray. 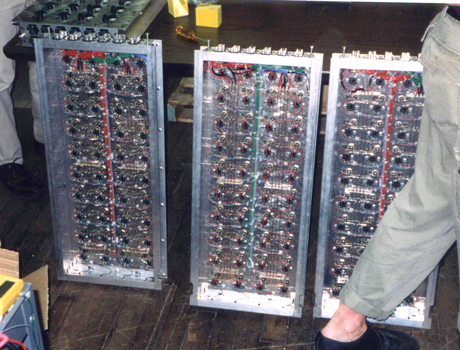 It holds 40 8-pin vacuum tubes. machines, and every tray had to mate up with every bay. Another great tolerance challenge for a hand built machine. Note the hand wound coils for defeating high frequency oscillation. would have spent a year just wiring all the trays. With co-workers at EH, summer 1999. The first of two automated tube burning machines I made is behind me. high voltage and filament supplies. An inside view from the side. and J.C.'s beautiful regulated high voltage DC supply on the right. the first day of testing. 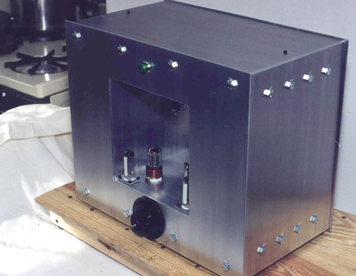 I originally began the Model A project in late 1999 in preparation for the 2000 New York Noise HiFi builders show. It is an original all tube design, with tube rectifiers, regulators, indicators, and amplifiers in a dual parallel configuration and single toroid power transformer. It has twin 300B triode fixed bias finals and a tube bias supply with dual 6SN7 drivers in a classic configuration. Output is 7 watts per cannel. 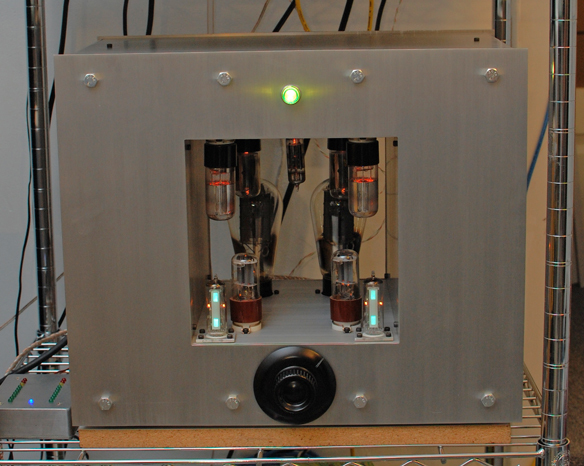 The dual 6HU6 CRT peak level indicators are out in front which are powered by their own tube regulated 210VDC supply. 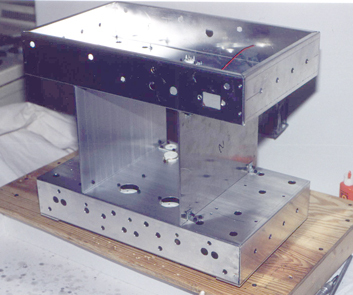 The chassis and all physical components are entirely hand made from raw stock aluminum by myself. I built the amp over a three month period on my kitchen table in Greenpoint, Brooklyn. I even hand made the single stereo attenuator using a dual gang 48 position continuous coin silver rotary make-before-break switch with 96 wire-wound precision resistors in a logarithmic curve. All of the power supply components are in the top of the chassis and all of the audio components are in the bottom. The two output transformers are set one in each side pedestal and there is forced air cooling throughout. The 'Model A' also runs through a set of high efficiency crossover MTM style speakers that I constructed later in the fall of 2000. It sounds like the voice of God, if there was a God and they had a voice. It is also very, very heavy. I never entered it in the show, but that is a different story. Constructing the chassis of the Model A, January 2000. On the left the output transformer is visible as the main components are being installed. Note the stove - Yes, I really did build it on my kitchen table! When you live in Brooklyn space is relative. 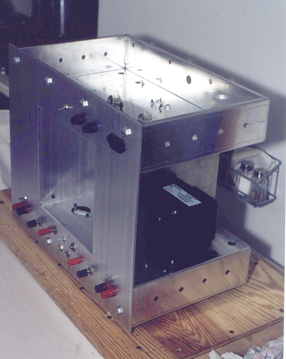 The finished chassis and stereo attenuator. Underside of the Model A, photo taken June 2012. Another video of the Model A in action, also showing the real time bias meter. 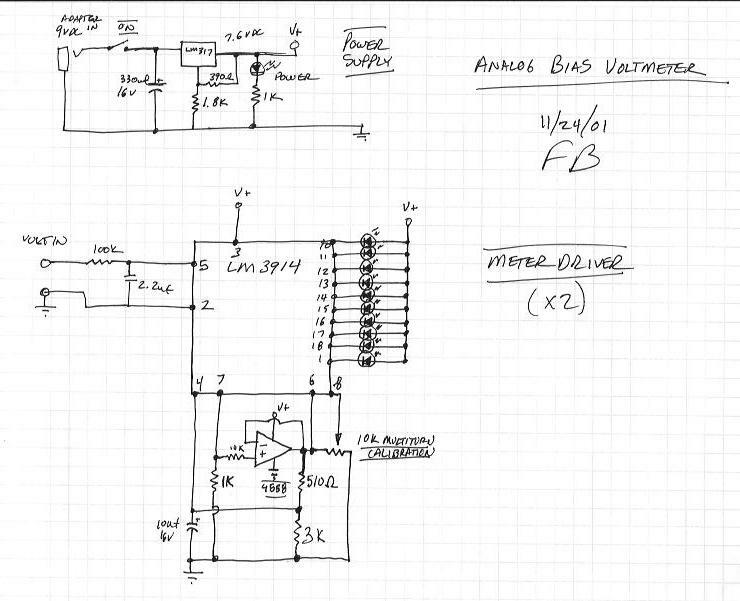 The bias meter is simple, made around the LM3914 meter driver and calibrated to a fixed internal reference voltage, and it measures the current output of each 300B output tube by sensing the voltage drop across a 50ohm power resistor on each cathode, which you can see on the schematic as the T1 and T2 points. The scale of the meter is set so that the lowest green indicates 65ma, the yellow 80ma, and red is over the top. In 1999 I caused a bit of a stir when a photo of me appeared in Stereophile Magazine. It was from an article about our renegade tube hifi design show “New York Noise” that JC Morrison had put on with Tubeseville’s Blackie Pagano, along with myself and other notable New York audio designers. I had dressed to impress as usual and the photo of JC and I that they published became a much talked about item. No corset, but a home made leather outfit and latex opera gloves..... not too bad. There is little evidence of the fact that we were up all through the night before wiring those immense speakers and setting up the space. The show was a lot of fun, a great day, and one of those wonderful and rare events in time that you really remember. Three people, an electric guitar, a bass, a reverb tank, drums, and big loud tube amps. Like most of my generation, BASIC was the first high level programming language that I was exposed to. My first experiences with a computer were on the Tandy TRS-80 back in 1979. I then got pretty good with Commodore BASIC on the C-64 in 1983, and then with the Apple II-e in 1984. The Commodore could be unstable, and it often conked out from overheating in the summer, obliterating possibly hours of keystrokes. So if you knew what was good for you a constant back up to tape was part of the lifestyle (cassette was standard). Despite that, the C-64 still had a lot more in the way of fun than the Apple because of its Sprites and the SID analog synthesizer chip that 8-bit fanciers still love to sample to this day. The C-64 allowed for some sharp honing of a programmer’s code crunching chops too. Due to its line structures and icon based short key codes you could pack in some pretty efficient code (and you really had to) with up to 80 characters per code line, and the control ports with ‘peek’ and ‘poke’ commands allowed the C-64 to control and monitor any peripheral TTL or CMOS device you might want to design also, and that was pretty powerfully cool for an electronics designer’s shop in 1984. True, if I would have had the means I would have gotten the Heathkit computer system kit with the home robot in 1982 and built it all myself, but I digress. When I got to college in 1985 they were still using an IBM mainframe that ran Fortran 77 and COBOL. The punch card readers were still plugged in, but fortunately I entered in the terminal era. Most geeks know about COBOL’s threat and Y2K, but why Fortran faded away is harder to judge. Fortran was short for Formula Translating, and it was one of the first high level programming languages developed by IBM in the 1950’s. It was a very popular workhorse for processing numerical data for decades. I do hear that there are hangers on that still update and use modern versions of the old Fortran, and a brief search showed that despite the prevalence of many other languages that Fortran is still used for supercomputing and number crunching applications today. It makes an old dinosaur like myself feel just a little younger knowing that good old formula translating is still going strong, silently, cranking inside a mainframe somewhere. Virtually everything in the human world is designed and manufactured by someone. It is an environment so pervasive that rarely would any person think for a second that right now, as you read this on your computer, that there is nothing within your reach or perhaps even within your sight that is not man-made. The chair you sit on, the fabric on its seat, the fibers in that fabric, the carpet it rests on, the floor and walls that surround you, the paint on those walls, the building the room is in, everything within that building, and even the neighborhood and country that building resides in, all are designed, manufactured and constructed by people. We get out of bed, go to the bathroom, put on our clothes, eat in our kitchens, leave our houses and apartments, walk down paths to get into our cars, drive on roads to our daily destinations, and go through our manufactured days in our manufactured world. The sea of constructed things and situations that we swim in truly overwhelms our intrinsic humanity, and as people we buy into the belief that our ‘reality’ is truth, when in fact we have invented it all. I have said for years that the biological animal is a human being. Place the human being into society, which is an artificial construct, and it becomes a person. I say ‘pervasive’ because society really does alter the human being into something else, something valuable and useful to the society. From cradle to the grave we each are made to play a part, whether we like it or not. In tribal times our social roles were simple. We were hunter-gathers then, nomads who stayed mobile and followed the food and weather. As we got more creative and began to manipulate our surroundings more we became more invested in our camps, and started finding ways to settle down in one place and build on what we made. Social structure and interdependence on a larger scale became necessary as our needs also grew – needs for reliable grain crops for beer and bread, and shelter and security for our growing populations. From the time of the earliest Egyptian writings it was all sewn up. People were just as smart, creative, and resourceful back then as they are today, and the people of those ages invented the world we still live in. Human social order, and in truth most of the things, structures, tools, and rituals that it depends on, were all invented and established, and have really not changed all that much since. In 1500BC a door was a door, stairs were stairs, pen and paper were for writing, math was for accounting and designing, boats were for sailing, textiles were for clothing, clothes were for wearing, make-up was for beauty, art was for admiring, beer was for drinking, medicine was for curing (yes they actually had some competent medicine then), jewelry was for adorning, cats were for cuddling, and the homes and neighborhoods of Cairo would have made any modern traveler feel at home. The reasons for society’s existence was the same then as it is now, and the human role in those social orders was just as crucial. The idea is to make the attractors and trappings of society outweigh the costs of participation, even if just slightly. I have made the analogy long ago that negotiation is usually a matter of approaching the discussion with a bat in one hand and a bar of chocolate in the other, and often using a little of both. That is what society does to us as well. Being born and raised within its framework makes defection unlikely, as most people grow up to truly believe in their lives and the social order as solid and an inalterable reality. We believe in abstractions such as money, power, and popularity – all interchangeable currencies - as the ultimate pursuits of our existence. Money is a clever human invention, and very necessary for control of everyone in the system. Without it, you starve, you freeze, you fail, and you die. Certainly makes it hard to argue that it is not even real. Money is today the single most arbitrary and contrived concept that humans have ever invented. Because of this it is also the most unstable part of the fabric of society worldwide. The rules of exactly what money is have changed over the centuries. Today it is primarily defined as acquired debt; the loans and obligations of the world’s population balanced against what it spends. Unfortunately, ever since the debt standard was established it was always clear to the accountants that invented it that there was a definite point of no return for that system, but they set it up that way anyway because it promised unheard of wealth for those that invent the system. A system made to be impossible from the start for relatively short term gain. This is the crux of all human social order, the inherent greed of people who control it, and the protection of their interests first and foremost. The key is to have that balance I had mentioned before, to make the attractors outweigh the costs for those who must bear the burdens, and so in the modern age there must be ever more attractions to offset the growing problems. These again must be invented, designed, and marketed by people, and popular enough to generate profit and be sustaining. At least for a time, until the next and newest distraction can replace it, and the cycle can perpetuate. Today this is what our society is all about. On the human level it has become the endless and often mindless pursuit of distractions and the acquiring and consumption of things. All the more need for those things to constantly be invented, like the ever expanding internet, and the tools of social networking. 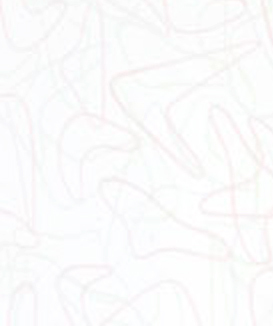 Because of modern social networking, people today feel more connected than ever, yet as individuals we are more isolated and as a society our relationships are more distant and superficial than at any other time in history. Quantity it seems well outweighs quality for most, and this feeling of being on the veritable pulse of goings on is just a new appealing shroud over the real structure of society. Feed them cake, as it was once said. The point of this essay is that it is important not to forget where you really stand in the world. Not that you can change it much, but you can a little. Not that you can do without it much, but you could a little. And perhaps this gentle nudging of things into a more human direction is all we as people can do for ourselves. Turn off your Blackberry and pick up a book. Turn off your texting and visit a friend. Forget tweeting for a moment and call your Mom. It would not take too much to move society into a more truly connected world, whether we invent it or inherit it. Either way, ours is a world that our predecessors made for a purpose, and we are the constant and ever-changing end result of that design. In that role, we are at the helm, and we have more power in that capacity than we are supposed to believe. We all have free will, and believe it or not, like it or not, we all have choices, and we all make decisions every day that determine our lives. If you are careful and selective, you can move your life in great ways, and move others along with you by your example. That is the daily challenge that we all face, in this completely artificial, made-up place we call home, built upon this amazing natural spaceship called Earth, floating in an outer spiral arm of the great Milky Way galaxy. If you want to keep perspective, all you have to do is go outside and look up. That is our universe, and we belong to it. It is so important to never lose sight of that fact. Out there is where reality truly is.